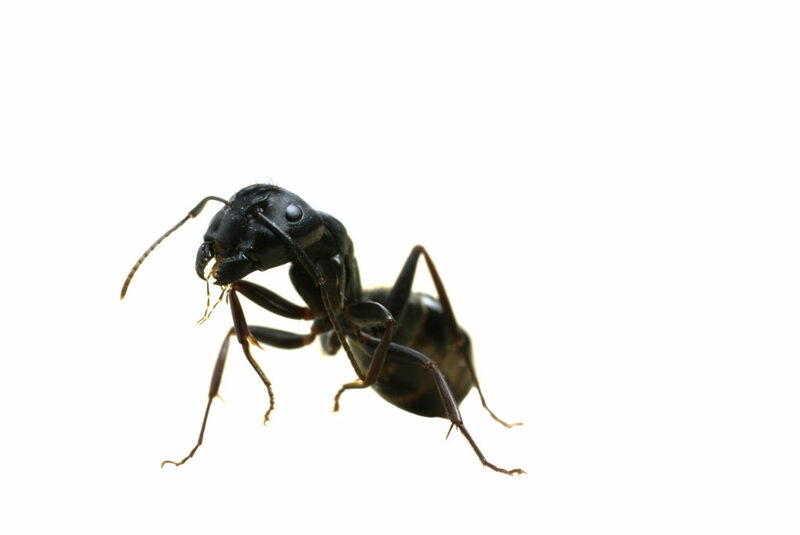 Carpenter ants are among the most conspicuous of ants found in and around homes. All kinds of houses, regardless of age or type of construction, are vulnerable to infestation and damage by carpenter ants; very difficult to control; colonies can contain up to 3,000 workers. How do I recognize a carpenter ant? • Three distinct body segments with a slim “waist”. • Wings long and of equal length. • Usually only about 1/8″ in length. What can carpenter ants do to my home? Carpenter Ants are a wood destroying insect. The US Department of Agriculture estimates that there are over 9 billion dollars worth of homeowner damage caused by wood destroying insects each year. That’s on average more damage than all fires, tornadoes, hurricanes, and floods combined in the United States. When Carpenter Ants invade a structure they hollow out galleries in the wood. The smooth clean, sculptured appearance of their nesting galleries is a characteristic of Carpenter Ants – thus their name. This is an interesting point, but these perfect galleries can diminish the structural integrity of your home. How do carpenter ants get in? Carpenter Ants can enter your home while searching for food, moisture, and shelter in a variety of ways. These include: crawling up the foundation and finding an entry point, Dropping from tree branches on to your roof and other areas of your house that are positioned under the trees, Crossing utility wires that lead into your house, Being brought in on fire wood or other means, Or, just walking in the front door. How a Double D professional protects your home and property. Our treatment techniques may vary according to the above methods. Our basic mission is to get materials in contact with areas that the Carpenter Ants colonize. This may be done in a variety of ways. Most often our mission is accomplished by drilling small holes in the area to be treated, using special equipment to inject the material, and repairing the drill holes with unfinished wooden dowels. After our initial inspection you will receive a diagram documenting the procedures to be performed. Other questions about Carpenter Ants. As with any service that Double D offers, safety is our primary concern. All products are registered for use by the EPA and have a long record of use in diverse and sensitive situations. It is however recommended to keep children and pets out of the way during treatment. All material that we use will not harm lawns, trees or shrubs. Double D guarantees its Carpenter Ant treatments for 90 days, which includes re-treatment if needed. Materials break down naturally and other uncontrollable factors may contribute to reinfestation. This procedure includes exterior treatment and inspection of your home for your peace of mind. After all, your home is probably one of your largest investments. Let Double D Termite and Pest Control protect it!! It does take some time for the treatment to take full-effect. The time will vary among structures, but generally 2-4 weeks. It is important to remember that you may continue to see Carpenter Ants outside because they can be nesting in trees, wood piles, etc. They will also travel as much as 300 feet from their nest to forage for food. This is not evidence of a reinfestation. However, if you see many Carpenter Ants in your home on a regular basis, you may have a problem and you should call for a supplementary treatment. You can send us a e-mail.